It's a liberating feeling to walk free among the animals of Africa. It's just past 8am as my motor- boat starts to cruise through the winding waterways near the Xakanaka Lagoon. Tall reeds and rows of papyrus brush the boat as we speed through the shallows and twist around sharp corners. 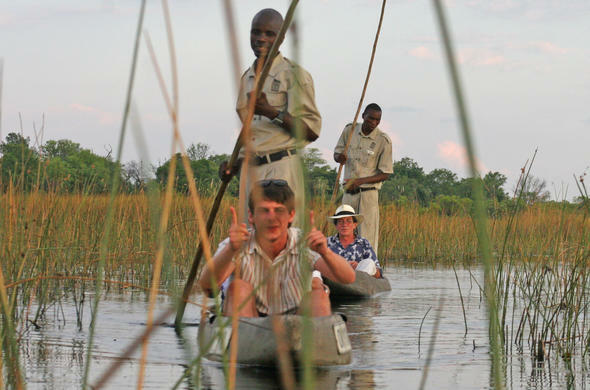 I'm on my way from Moremi Game Reserve to Camp Okavango, a luxury lodge run by Desert & Delta Safaris, deep in the heart of the Botswana's Okavango Delta. We enter the wide Monachira Channel and I relax in the morning sun, content to let the wonders of this waterworld wash over me.The bird life is prolific and I click away at a fish eagle perched majestically in a tree. It stands still, scanning the water for possible victims, then flies off as we pass. Other species I see are herons, darters, cormorants, African jacanas and a large saddle-billed stork.There's not a breath of wind and we stop the boat in mirror-like water to photograph beautiful water lilies surrounded by reflections of reeds and cloud. Up ahead, a crocodile basks on a sunny bank.After 90 minutes, we arrive at the halfway mark, tiny Gadikwe Island, where I transfer across to the boat that has arrived from Camp Okavango. After coffee and biscuits, we continue through narrow channels lined by tall papyrus. As we near the lodge, we see elephant and red lechwe grazing on a floodplain. 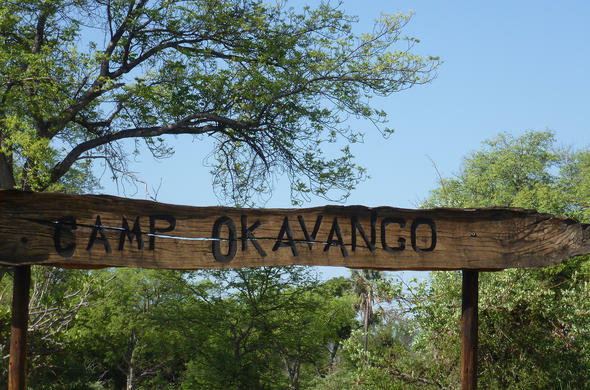 Camp Okavango is situated on the remote Nxaragha Island and accommodates just 24 guests in beautifully furnished East African style safari tents, each with its own sundeck and en-suite bathroom. The shady grounds have a pool, reading benches, an observation platform and a hammock for that essential midday siesta. Unlike other areas of Botswana where the daily schedule revolves around game drives, in the Okavango Delta, activities include guided nature walks on islands or mokoro trips through the shallow wetlands.I'm warmly welcomed at the jetty by camp manager Karel van Heerden and his Chilean wife, Pilar. ' After lunch, our main guide, John Kana, will take you out for a mokoro trip,' says Karel. 'So for now, you can unwind and relax. 'The day has clouded over and we set off for the water adventure in muggy overcast conditions. But soon the sunlight breaks through and we launch the fibre glass mokoro into the delta's shallows. There's not a breath of wind and the water resembles a mirror as John pushes us off from the bank. It's so surreal as we drift slowly over the still surface, watching red lechwe grazing on the grassy floodplain. 'There is a chance that we may see lion or elephant and if we do, just stay still and don't run, because they will leave,' instructs John. 'But if we come across an angry buffalo, we will need to run up a tree or hide in a bush because they can be the most dangerous of animals. 'We set out in the early morning light and soon catch sight of four giraffes that gallop gracefully away. Further up ahead, an elephant stands motionless under a tree. Then the sun rises in a fiery display, turning the fleecy clouds into a pink kaleidoscope. We stop at a sandy track and John indicates the paw prints of a large male lion that passed here during the night. 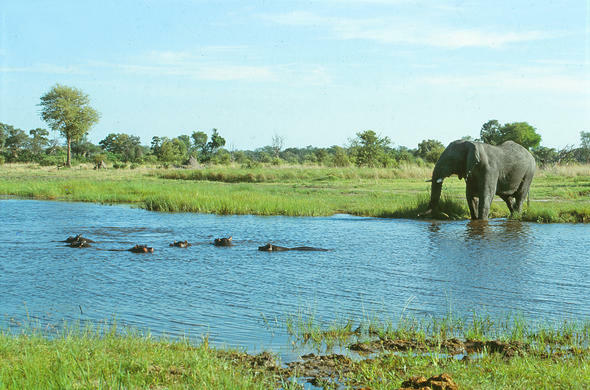 The day warms up and we rest on a termite mound where we watch a herd of red lechwe grazing on the floodplain and a huge hippo that waddles out of the reeds. In the distance, five elephants emerge from a wooded area and walk slowly across the yellow field. It's a liberating feeling to walk free among the animals of Africa.Copyright © Jeremy Jowell. All rights reserved. Reproduction in whole or in part without the permission of the author is prohibited. 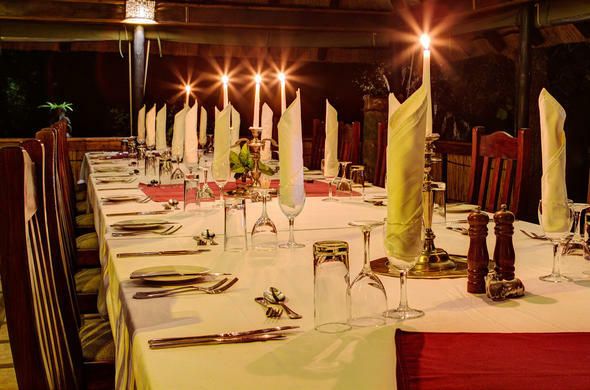 Back at the lodge, dinner is a sumptuous candlelit affair. For starters, there is stuffed mushrooms before the main course of beef fillet and sweet potatoes sprinkled with cinnamon. Dessert is a delicious banana pudding and fresh fruit salad. 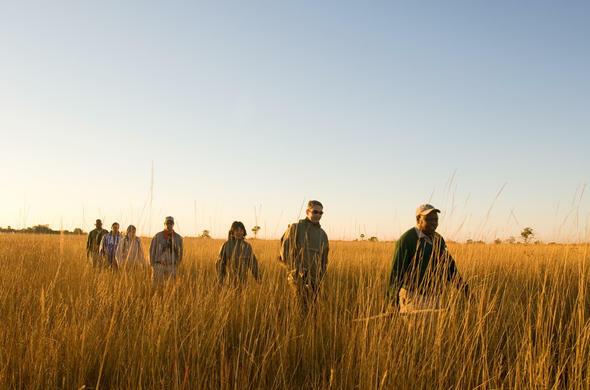 Unlike other areas of Botswana where the daily schedule revolves around game drives, in the Okavango Delta, activities include guided nature walks on islands or mokoro trips through the shallow wetlands. It's just past 8am as the motorised boat starts to cruise through the winding waterways near the Xakanaka Lagoon. Tall reeds and rows of papyrus brush the boat as they speed through the shallows and twist around sharp corners.